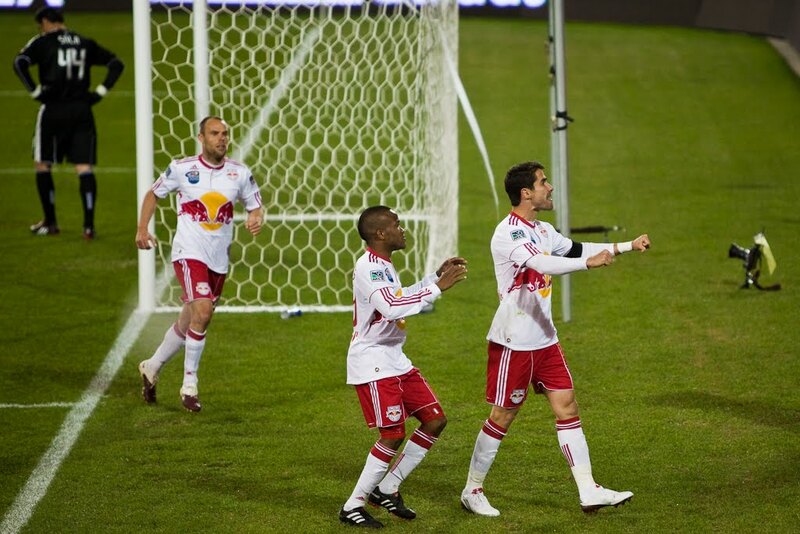 RBNY Tuesday Musings: You Gotta Be Kidding Me! To borrow a classic phrase from the one and only Shep Messing. And I'm not talking about this past Saturday's game against Houston. A wasteful draw, if ever there was one, where RBNY gave up the lead in the 90th minute (and a man up, no less). No, I'm talking about the shocking report that the one and only Juan Pablo Angel (pictured above, right) came really close to being traded to Seattle for Freddie Ljungberg. This rumor first started on June 13th, by way of an Emerald City Supporter tweet, which was then picked up by mls-rumors.net. It wasn't a big secret that Ljungberg was on the outs with Seattle, and was looking to get out of there, but none of us here in Red Bulls Land believed this to be anything but a bullcrap rumor. How could Red Bulls management even consider sending our leading scorer (9 goals at the time) to Seattle, when every one of us was looking forward to his partnership with TH14? It was just unthinkable! But then, Michael Lewis hit us with the story linked above and there it was. Now, no player should ever be bigger than a club and Juan Pablo should be no exception. I must question, however, the sanity of this proposed deal. At first, it just looks so one-sided that it is still difficult for me to believe it was even considered. Juan Pablo has been in double digits, as far a goal production is concerned, ever since he joined our club (he scored two at Houston, to bring his current total to 11). Ever the consummate professional, never complaining about anything to the press, Angel would seem to be the polar opposite of Ljungberg, who even skipped Seattle's training camp because he wanted to see what happened with the Collective Bargaining Agreement. You and every other player in the league, douche, but everyone else showed up. Even taking all that into consideration, Ljungberg is NOT the player the Red Bulls so desperately need - that elusive, world class #10 creative midfielder. He's better on the right wing and is about as good as Joel Lindpere (in my opinion) at CM. So what that he's Swedish (yeah, Mr. Backe, I'm calling you out) and so what that he played with Henry at Arsenal? Just look at how Henry and Angel played off each other this past weekend in Houston. Now, imagine that partnership with an ACTUAL, world class creative midfielder behind them. Rafa Marquez was formally introduced to the press as a RBNY player, today. You can watch the archived press conference by clicking here. Was former Hull City midfielder Geovanni a RBNY target? So says this article. Mac Kandji has been declared "untouchable" by Erik Soler.